Sitting for long periods of time each day – whether you do it as part of your job, studying or watch television – has recently been shown to have numerous health risks. These risks include risks for heart disease, weaker bones, herniated discs, some cancers, obesity, high blood pressure, and even higher mortality rates. 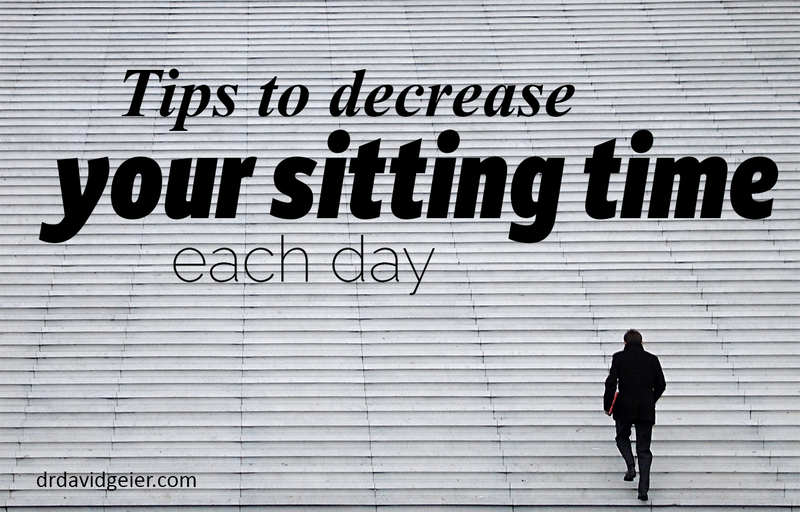 How can we decrease our sitting time each day? Regardless of your job or hobbies, there are ways to cut your sitting time and get physical activity during your day. Adding some or all of these steps to your day could cut down some of the negative health consequences of sitting. More employers are embracing the idea of a standing desk. If you work at home, buy a standing desk. Or work at a high table or counter. Better yet, buy a treadmill desk, or position an elevated desk above a treadmill. You can walk at a slow pace and do most desk activities. Whenever you have a call, take it while standing or walking. Set reminders to stand up every 30 to 45 minutes. Some fitness bands have these reminders, so that they vibrate if you haven’t moved much recently. If you don’t have a fitness band, use alerts on your phone to remind yourself to get up and walk around. Keep ketllebells or dumbbells near your desk and use them a few times a day. This equipment allows you to work some of the larger muscles in your body that you might not work with just walking. Walk for any tasks possible at work. Rather than emailing or calling your colleagues in your office, walk to their desks to discuss work topics. Take the stairs instead of riding the elevator. Again, every effort to stand up and move can be helpful. Look closely at your routine and find ways to add physical activity to your day. Is playing football safer than riding a bike?